The heartthrob of a million female fans is a lovely brother we hear. 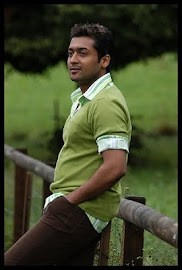 Surya who loves his sister Brindha very much, is often seen spending quality time with his family. Sivakumar, his dad has inculcated strong bonds between siblings and expects them to stand up for each other. Surya even on voting day in Chennai, was seen patiently chaperoning his sister to the election booth. Karthi too it seems is very protective of her and takes her to city events and concerts. In turn, sources say she is very protective of him and is the proudest when she catches his movies.